transitioning to lighter appetizing Spring/Summer delights. On a chilly evening in April, we were fortunate to dine on some of the new additions as well as some long time favorites. Enjoying a table by the wall with a view of the harbor, bar, and the open kitchen, our lovely waitress Heather explained the new menu and small plates. Throughout the evening, we enjoyed a few of the wines from their wine list; complete with selections from Sparkling/Champagne, to Red and White choice selections, to Port. 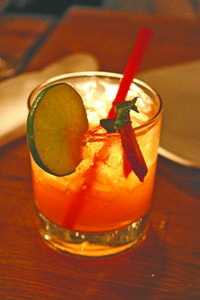 In addition, Alison our bartender mixed us a perfect ‘Tallulah’, a tequila surprise worth trying. 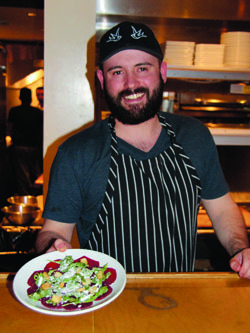 To start, Chef Ben prepared Beet Carpaccio; thinly sliced Beets dressed with, fresh Baby Arugula, Goat Cheese, Normandy Cider Vinaigrette and crispy Rye Croutons. The beets were gently flavored, and the c ombination of fresh ingredients is mouthwatering. Accompanying the beet dish was the popular signature dish, Asparagus Fries with Lemon Dijon Aioli dipping sauce. As always, the fries were lightly battered, fresh and irresistible. Each of the three varieties of mussels offered on the menu: White Wine, Curry, and Andouille, sound delicious and worthy of sampling. In the past, I’ve had the Curry mussels with ginger, garlic and cilantro and they were bursting with flavor. This evening we enjoyed the Andouille Mussels, prepared with shallots, garlic, tomato and basil, and Andouille sausage. The tender mussels were bathing in the light aromatic broth that offered a fresh balance of flavor; it was also perfect for dipping the accompanying toasted bread. To round off o ur meal, Chef Ben sent out the Shrimp and Grits, and Fried Chicken. Both dishes are unique, tasty and pleasantly appetizing. 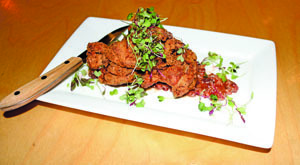 The piquant Buttermilk Brined Chicken served with Bacon Jam was lightly battered, plump, and moist. While the Shrimp & Grits with Andouille Sausage, Tomato, and lime presented an intriguing combination of texture and flavors. The large grilled shrimp atop the creamy grits made for a delightful dish. After sampling so many small plates, and there are many more to choose from, Heather presented us with two dessert choices of the evening. The gluten-free Flourless Chocolate Cake perched upon drizzled fresh raspberry puree was a chocolate lover’s delight. At the same time my dinner companions raved about the thick and moist Nutella Bread Pudding served with fresh whipped cream.We always enjoy Swallow East for their eclectic and evolving menu, beautiful full bar, in and outdoor music, and the friendly atmosphere. From their new manager Dave, to the lovely waiters and waitresses, and their talented bartenders, it’s a nice place to dine or just meet up with friends.